Today is the birthday of photographer Edward Weston. Weston is considered one of the most innovative and influential photographers of the 20th Century, so I thought it might be interesting to explore a couple of his images. Why only two images when there are so many important images to choose from? Well, these are two images that are considered Fair Use for discussing his work without violating copyright. Having said that, please search on your own and enjoy looking at his work on web pages, like THIS one, that are authorized to show his art. As a teen, Edward Weston was gifted a camera, which, in essence, began his photographic journey. Over the years, his photography style included soft focus pictorialism to pictorial realism. According to most accounts, his transition from the soft focus style to sharper resolution was the result of photographing the American Rolling Mill Company (ARMCO) in Ohio during the 1920's. These photographic images were praised by Alfred Steiglitz and are credited as photography that emerged into the Modern era. Among Weston's many contributions to photography were his designation of being the first photographer to receive a Guggenheim fellowship. He was also instrumental in photography's designation as an art form, was an avid writer documenting and sharing the photographic process, as well as being the photographic artist that developed the concept of previsualization. In my opinion, Weston's strongest images are the common, everyday subjects like the two images below. Can't you just feel your stress level dropping while looking at these beauties? Apparently, Weston was inspired by Henrietta Shore's large paintings of sea shells. He even borrowed some of the shells Shore had been painting so he might further explore a still-life series. After a few weeks of exploring different kinds of shell, backgrounds, and I'm guessing lighting, compositions, etc., well, this image titled Nautilus is one of the results of that exploration and discovery. It's a good thing, because this photograph has been credited as one of the most famous photos ever. In the 1930's, Weston began creating close-up images of fruits and vegetables. During his exploration of fruits and vegetables as subjects, Weston photographed green peppers for several days. The peppers series is probably his most iconic set of images from this body of work, and due to their almost modern sculptural quality, these images have been likened to the sculpture of Hans Arp. Oh the lighting! Give me a moment to swoon a bit. Okay. I'm back. This beautiful, dramatic lighting certainly lends itself to focusing on the form of the pepper. I think the light is what makes the photograph sculptural. And, can I say, Oh, la, la. 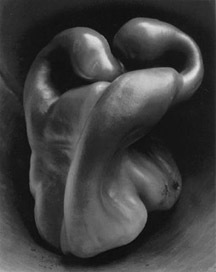 Happy birthday Edward Weston! Thank you for all your contributions to photography as an art form, as well as the eye candy we are still enjoying today.